Cheapskate alert! The parking fee is $10.00. After hiking here, I hope you’ll agree that 10 bones is a steal. You want to visit what very well might be the coolest natural place in the Hudson Valley. Then I took a few more steps, out onto the Wiley-Coyote-style cliff that seems to exist solely to give you the best possible view of the falls, and I understood that it wasn’t an overstatement at all. The falls drop 180 feet to the bottom of what feels like your own private canyon. This is indeed one of the Earth’s Last Great Places, without a doubt, and we’re lucky to have it right here in the Hudson Valley. That being said, the falls aren’t always running full steam. Come here in late summer, and you’ll likely see a trickle with a similar gallon-per-minute rating to your favorite shower head. But when they’re going (as they’re likely to be in spring or early summer, or after a good solid rain other times of year), man, I don’t know a nicer spot in the Hudson Valley, and maybe not in New York. Oh, what the heck. Maybe not in the whole world. There are also some fantastic ice caves to explore at Sam’s Point. You can feel a cool breeze blowing through the caves even on the hottest summer day. Because they stay so cold, the ice caves are often impassible well into the spring. It would be a bummer to get all the way down to the ice caves entrance to find them closed, so if you’re here in early spring or late fall, check at the visitor’s center at the trailhead to make sure they’re open. If you’re looking for a moderate hike, a 5-mile stroll from the parking area to Verkeerderkill Falls and back would be my recommendation. That’s the hike I did on my first five visits here; it’s beautiful the whole way and not too steep. Optionally, you could add a spur to the ice caves and another spur to Lake Maratanza, but that would be a lot of hiking for one day (I’ve never done all three in one shot, but in theory it should be pretty doable for hard-core hikers). In the trail guide below, I’ll give the hike as if you’re just visiting Verkeerderkill Falls and coming straight back (which is what I normally do here), but I’ll list optional steps, with the extra mileage you’d be tackling, if you’d like to visit the ice caves and Lake Maratanza as well. I highly recommend visiting all three, but depending on how much hiking you like to do at once, you might be well advised to check them out in multiple visits. **UPDATE October 2014** This place is not a well-kept secret. In response to a Facebook post with nice pictures of Sam’s Point, some friendly hikers dropped a couple of good tips about parking at Sam’s Point: “you should note in your trail guide that there is very limited parking at Sam’s Point and once the lot reaches its capacity, they turn away hikers. no parking on the road allowed. If you don’t get there early on weekends, you’re very likely to be turned away!” and “I was there last week during the week too. It was amazing! I asked about the weekends. They said from 9:30 on they are outside managing the parking situation. They only allow 7 holding spots to wait for a parking spot. The rest are turned away. During the week is best!” Thanks for the sage advice, Danielle and Kelly! 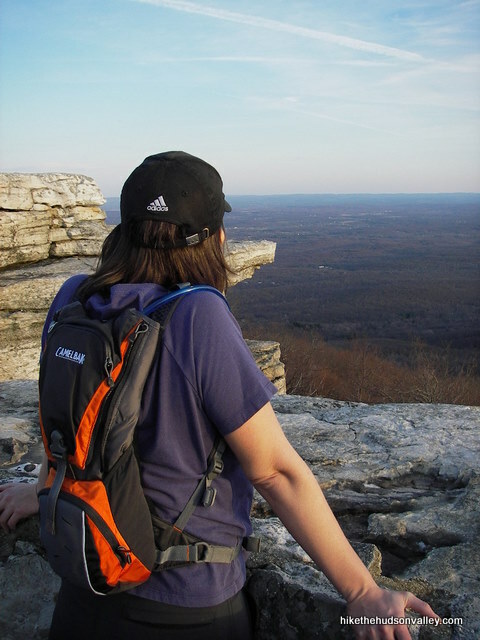 **UPDATE May 2015** Sam’s Point officially became part of Minnewaska State Park Preserve in April 2015, and is no longer owned by the Nature Conservancy. As alert hiker Salley Decker wrote to me, here’s one ramification of that change: “Any New York State resident age 62 or older can enter a New York State park free of charge for day use (no parking fee charged) during the week. A driver’s license must be provided. This free access applies Monday through Friday on all non-holiday weekdays. (The parking fee must be paid on all holidays.) The free access applies as long as at least one NYS resident age 62 or older is in the car. The NYS Empire Pass would also be accepted at the parking lot.” Thanks, Salley! **UPDATE June 2016** Due to a wildfire that recently tore through the park, the falls trail detailed below is closed until further notice (perhaps re-opening in mid-late 2017). Some areas of the park are now open, including the ice caves (weather permitting – they are closed in the winter and generally re-open in May). Before planning a visit here, be sure to check the official Sam’s Point page for the most current trail information. **UPDATE August 2017** The trails outlined below are all open again! Hooray! (And thank you, Thomas O’Brien, for the heads-up on this site’s Facebook page.) Looks like the area still has a lot of healing to do, but it’s wonderful news that it’s healthy enough to handle visitors again. 1. The Minnewaska State Park Preserve has a nice trail map available from its official NYS Parks Sam’s Point page. They should have copies at the visitor’s center as well, but you could look extra cool by already having one of your own. 2. From the parking area, head around the gate on the main trail, shown as the Loop Road on the map. Almost immediately, you’ll have the choice to go left, towards the Huckleberry Pickers’ shacks (which are a historical curiosity, but you needn’t feel like you’ve missed out on anything if you never pay them a visit, especially if you’ve seen a shack before), or right, towards Sam’s Point. We’re going right. 3. Follow the decrepit old road as it gains altitude and meanders through several switchbacks. In just a few minutes, you’ll find yourself looking up at some very cool cliffs shooting up on your left (the same ones you saw on your drive in). At one point along the cliffs, you’ll see a giant rectangular slab of a rock on the ground in front of you. Look at the cliff directly above it, and you can see the hole this rock left when it dislodged and fell. I feel like I should have some sort of punchline here, but I just like that rock for some reason. 4. As the road continues climbing, some beautiful views, complete with rocky viewing platforms, open up to your right. Take a moment to enjoy them. 5. The road gains enough altitude that you’re now even with the tops of the cliffs you were just walking under. In a moment, on your left, the road opens up into what probably used to be a parking area. If you took this left turn, you’d find yourself on a very short spur trail to Sam’s Point, a panoramic vista where, apparently, some guy named Sam survived a jump off the cliffs after angering some Native Americans. No word on whether Sam deserved to get caught or not, but it’s a good story, anyway. I like to save Sam’s Point for last, as a grand finale before heading back to the car, but there’s no reason you couldn’t scope it out now if you just can’t stand to wait – it’s just a short walk over there. Go ahead if you can’t control yourself. I’ll wait here. 6. Once you either checked out Sam’s Point or delayed your gratification for later, continue straight on the Loop Road, which is mercifully flat compared to the climb you just completed. The bushes rise up on either side, and you won’t be able to see much to your right or left. You’re looking for your first right turn, on the road that heads downhill towards the falls and the ice caves. When you come to this road, turn right off the Loop Road. 7. A very short distance after you turn off the Loop Road, the Verkeerderkill Falls trail heads off to your left, through the scrubby bushes. This is your decision point. Continuing straight down the road takes you to the ice caves, and adds 1.1 miles, roundtrip (that doesn’t sound like much, but it is a rather steep and slow-going 1.1 miles). Going left takes you to the falls, a 4-mile roundtrip from this spot over very rocky terrain that generally slopes gently downhill toward the falls (though the uphill return feels somewhat less gentle). 8. Optional step: Visit the ice caves. Keep heading down the road, which descends steeply for .3 miles to the ice caves. At the bottom of this road, you’ll see what must have once been the parking lot for the ice caves, back when this was a commercial attraction. A White Trail takes you on a .5-mile loop through the caves. Take the closest entrance, and the loop will dump you back onto the far side of the parking lot later, after you’ve caved it up. Have fun exploring! There’s one spot one the White Trail where you have to open a door, and a light pops on in the cave (unless a previous visitor already turned it on.) It feels like you just walked in on a surprise party for one of the seven dwarves. There are also some nice views towards the end of the loop. Once you’ve completed the loop and come back to the parking area, slog back up the road .3 miles to the spot where the Verkeerderkill Falls Trail heads off to the right. 9. Okay, whether you chose to check out the ice caves or not, it’s time to explore the Verkeerderkill Falls trail. Hop on and enjoy the stroll amongst the globally rare dwarf pines. You’ll usually have views off to your right as you go. There are only two minor bummers about this trail: it wanders downhill most of the way (meaning it’s uphill on the way back), and it is very rocky. (UPDATE June 2013: Chris’ comment below reminded me of a third minor bummer: During wet conditions, this trail doesn’t drain the quickest. If you come after a good rainfall, prepare for puddles.) Otherwise, it’s just about the nicest trail I know of, with wide views much of the way, including views of the northern Shawangunk Ridge. 10. As you get closer to the falls, you’ll plunge into a magical little birch grove. If I was a gnome, this would be my hangout. 11. The closer you get to the falls, the steeper the trail heads downhill, and the bigger the trees get. Finally, you’ll arrive at a stream crossing, just above the falls. If the water is very, very high, you’ll have to follow it upstream for a while to find a crossing (this has only happened to me once, after some serious, serious rain). Usually, it’s just an easy hop-and-a-skip to the other side, where you can stop for a moment to strike a pose, if you’re so inclined. 12. On the far side of the creek, the trail turns downstream, and you’ll see the sign informing you that you’re now hanging out at one of the Earth’s Last Great Places. 13. Make your way to the cliff overlook on your right. Please be extremely careful here. There are no guard rails, and it’s a long way down. 14. Behold the falls, and then try to tell someone this isn’t one the Earth’s Great Places. About the dumbest thing I’ve ever seen a human being do was back in 2001, when my friend Chunks ventured onto the rocks on top of the falls to get a cool picture for his online dating profile. I’m including the pictures here because Chunks just sent them to me, and he did, after all, risk death to have them taken. As of this writing, Darwin thankfully hasn’t caught up with Chunks yet. 15. After you’ve soaked in the view of the falls, retrace your steps back up the Verkeerderkill Falls Trail. It wasn’t this steep on the way down, was it? 16. When the Verkeerderkill Falls Trail dead-ends into the road, take a right to head back towards the Loop Road (going left here would take you to the ice caves). 20. Whether or not you stopped at Sam’s Point on the way in, take a stop there now, across the old parking lot on your right. If angry people are chasing you, consider taking desperate measures. Otherwise, just relax and enjoy the view. 21. After you’ve taken a picture or two at Sam’s Point, follow your steps back down the road to your car. Once you get there, try to think of a better way you could have spent ten dollars. Directions to the trailhead: From Walden, take Route 52 West for about 14 miles. As the road ascends steeply, keep an eye out for Cragsmoor Road on your right. Turn right onto Cragsmoor Road and follow it for about 1.4 miles, past the town library. Turn right onto Sam’s Point Road (go slow heading into the turn, it can be easy to miss) and pass the Cragsmoor Fire Dept on your right. Stay straight on Sam’s Point Road for about a mile until it dead-ends into the parking lot. You can also get directions by checking out the Sam’s Point entry on the HiketheHudsonValley.com Google map. **UPDATE March 2019** According to Litza’s helpful comment below, you should not enter “Sam’s Point” as a destination into Apple Maps, or you’ll be taken to a nonexistent road where you’ll have to exhaust your entire expletive vocabulary. Using the visitor’s center address of 400 Sam’s Point Road apparently works just fine, as do the GPS coordinates just below this update (and the fire dept address above). Thanks for the heads-up, Litza! This is a spectacular hike, but I want to caution users of Apple Maps to use the coordinates linked here or plug in the address of the visitor center (400 Sam’s Point Road). If you just type “Sam’s Point” you will be directed to a dirt road that does not exist! I spend a lot of weekends nearby and see dozens and dozens of frustrated drivers going back and forth when they follow these bad directions. Thank you so much for the heads-up, Litza! I’ve added your warning to the “Directions to the trailhead” section above. I hope that helps to save folks from trying to find a road that doesn’t exist! I am a hiker also who is conducting research on the problems hikers have with parking. It would be great if I can interview at least five other hikers. The interview would last no more than 20 minutes and we can do this by phone, skype etc. Trail to the falls and back were nice yesterday. A bit wet in some places but alt trails were made. Ice caves were nice also. Falls were raging after Tues rain. This hike is great. I am also interested in going there. But I have a question for you. I am a mom of 4 years old baby boy. My problem is how much safe is this place for my baby? Thanks in advance for your suggestion. Hi, Deborah! A four-year-old should have no problem making it to the view at Sam’s Point — it’s an easy stroll up there, and well worth the trip all by itself (perfectly safe, as long as you mind the edge of the cliffs). From there, if he’s feeling very energetic, I’d recommend the ice caves instead of the waterfall. The waterfall trail is very long and rocky. The ice caves trail is shorter, and more like a road until you get down to the caves themselves. That would still be a long stroll for him, but would probably be your best bet. Hope that helps — happy adventuring to you both! My husband and I did this hike yesterday and it was so cool! It thunder stormed all Saturday night, so when we started out, we got really cool views of the valley all full of clouds. The trail was thankfully not soggy! I will note that either I wasn’t paying attention, or it’s been taken down–I did not see the sign declaring it as one of earth’s last great places. I did, however, see a sign pointing to the left which read “trail!” Apparently, the trail continues on to become an additional (estimated by our googling) 5 mile loop. We opted out of that and went back the way we came. Thanks for the fantastic trail guide! We will definitely be checking out more of these hikes. This hike is great. Beware that there is very little shade on this hike apart from the ice cave loop. The heat can make the ridge to the falls seem grueling. Luckily there are some cross breezes and wild blueberries to eat as you go. , totallyThis is an amazing hike and we highly recommend it to all! Such a gem in New york City’s background and we happened to discover it by chance. Depending on the caliber of the kids, they should be able to do this. The Ice Caves are the most wonderful part of this loop, we also drank the chilled water. Once you get out of the Ice Caves, there is an amazing viewing point too – the waterfall hike is a long one (with not a lot of water at this time of the year), but the terrain keeps changing and the views are nice. Sam’s point is the first station and very accessible from the start! Doing Sam’s point, the waterfall, the Ice Caves and the Lake in one day is a looong hike – we would recommend breaking it up. Lots of berries on way! Did the ice caves still have a decent amount of ice after our recent heat wave? Did this hike yesterday but continued all the way up to High Point Trail, then around the the High Point Carriage road and back to the parking area. The High Point Trail may not get a lot of traffic, but it is absolutely spectacular. Tons of great views from the various rocks. Requires rock scrambling in a few places but nothing too strenuous. One of my all time favorite hikes. I went today and the trails were open except for the ice caves and the waterfall trails. Also the wall that is pictured at sams point is no longer there it’s just open rocks ! Does anybody know if the trail to the falls has reopened? I went here last summer, paid $20 (Yup. Not $10) for parking, just to be told that the trail we wanted to take was closed off. I know that some trails were open but not the one to the falls. Awosting falls wasn’t too far off so we went there, but I’m hoping to try back here soon and don’t want to take the hour and a half drive to find out the falls are still closed! She also confirmed that parking is still $10 per car. Not sure what happened last summer with getting charged $20 – bummer! Hope this all helps — looks like it’s still a waiting game for the ice caves and falls. Thanks so much for all the information! That’s very helpful! I’ll be sure to look out for those trails reopening. Does anyone know if the trail has reopened? Thanks! I just checked the site today and it seems to be open! It is *NOT* open. The Verkeerderkill Falls trail remains closed, as listed in the link posted, and as well on the link this website has posted. I spoke to park staff today (6/7/17) at the visitor’s center, and they explained not only was that trail and surrounding area burned last summer, it just so happens that the falls are on private property, and the owners of that property have requested that no one access the falls. It was also mentioned that it probably won’t be reopened until next year. Thanks for the update, Amy! Looks like the ice caves are open again, along with the loop around Lake Maratanza and Sam’s Point itself, but we shouldn’t be holding our breath for the Verkeerderkill Falls trail to reopen. When I called about a month ago, they sounded hopeful that it might reopen soon – they were getting ready to do a new assessment then. Your information is more current, and the assessment must not have gone as well as they’d hoped. Sigh. At least the official Sam’s Point web site seems to be kept up-to-date — we can just keep hitting refresh and hoping. I remember hiking the high point loop 12 years ago and not seeing a soul until getting back to the lot. Did the same loop a few years back and was amazed to see the number of folks throughout my hike. You’re right about the results of sharing photos on social media. I hope all the trails open up by this coming spring but I highly doubt that will happen. Is this kid friendly? I’d keep it to the shorter portion of the hike, but as far as difficult and danger level is this okay for kids? Michelle, did you take your kids? I’m curious, thinking of taking mine this weekend. No unfortunately not yet 🙁 when I wanted to go the trails I wanted to take were still closed due to the fire. I think they still are but I could be wrong. Sam’s point is short so kids can definitely do but the cave loop takes a while, that’s like a 8yr old+ trail i would say The only part I wouldn’t take kids to is the waterfall loop. Ok great! Thank you so much for your reply. Picked up trekking poles and going to give it a go. It looks like most of the trails have reopened. According to the official NY state website for Minnewaska/Sam’s Point, some of Sam’s Point area has re-opened as of late May, 2016. Sam’s Point overlook and ice caves (and corresponding roads/trails) are open. Verkeerderkill Falls area and trail are closed. Check website for more specific info and closure map. Thank you, Paul! I’ve updated the trail guide above to make sure everyone checks the official Sam’s Point page for the latest information on trail closures. Really appreciate the heads-up, and nice to see at least some parts of the park opening back up again! As of 4/23/16, Sam’s Point is apparently dealing with a rather large wildfire. You may do well to plan your adventures elsewhere for the time being. Thank you for saving me a few hours of my life, I would have gone this Sunday for nothing. Never could have imagined this! A huge part of Minnewaska State Park was in blaze. Just called Sam’s Point to confirm – they are closed until further notice. Thanks again for highlighting a great hike in the region. The Ice Caves were a lot of fun! A tight fit in some spots, but very cool. No snow left in October – just in time for a new batch. I also got lucky that there was water flowing over the falls! Please keep up the good work! Awesome, thanks for the report, Jim! You picked a perfect day for it. Has anyone hiked to the falls lately? Wondering if it is worth going there so late in the summer? – looking to go this weekend Aug 15/16. thanks! Linda, we hiked to the falls for the 1st time earlier this summer. Even though the falls were not very active (dry spring), they was still very pretty. However, we found the hike to be a lot of work. The trail is VERY rocky and you really can’t look up for fear of tripping. So you’re head is always down watching your feet and missing the scenery. We find the Ice Caves hike is a bit more leisurely and enjoyable. Hi Linda! Hope I’m not too late here to be helpful. Diane Boland shared a shot of the falls from August 6 to this site’s Facebook page. Looks like they’re still going pretty good there. I would generally expect the falls to be a trickle at this time of year, but it looks like they might be doing better than that now, despite the general lack of rain we’ve had (today’s storms may have helped some, too). Best of luck if you give it a go! Mike, thanks for the info. It does look good – better than I expected! We ended up not going this weekend – opted for some biking – but its still on my list. Thanks so much for your website! Its an incredible resource that my friends and I use all the time! Enjoy! Wondering if anyone knows if the ice caves are now open? Looking to visit there in a couple of days (7/1/15). Thanks! Mike, thanks for the response – I have friends in Cragsmoor and they were evacuated yesterday. So as of Monday, apparently Cragsmoor is no longer safe either. Rain expected tomorrow so that may help. The ice caves trail was and is still closed … There was no reason for this to have even have happened if they had stayed on the open trails. It’s a very sad accident but why were they on a closed trail? I hadn’t heard about this until seeing your comments. Scary stuff indeed, and a harsh reminder to obey signage — when a trail is closed, you can pretty much guarantee it’s closed for good reason. I am concerned about the fires in the area. The local news is not giving specific fire locations but it appears very widespread. Is Sams Point being affected? Hi Tim – I don’t have any special insight here, but it does look like the general area is being affected: http://www.google.org/publicalerts/alert?aid=2dca70442d024eab&hl=en&gl=US&source=web. This lists Cragsmoor as the evacuation site, and the roads listed are very close to Sam’s Point. Scary stuff – hoping for the best. We hiked Sam’s Point for the first time yesterday. Your trail guide was great!. The ice caves were closed as of 5/3/15. The falls were running nicely. The dwarf pine and birch tree fields on the way to the falls were magical. The falls trail was dry with very few mud spots, all easily avoided. Just a hint for early morning hikers like myself. The paid parking lot does not open until 9 a.m. There is no parking outside the gate. I arrived at 7 and took a chance by parking outside the gate. I returned to my car at 9:45. a.m. just before the Sheriff started ticketing vehicles. Is camping allowed on this trail? By the way I love your website so much. Quick question… Do you think this trail is doable with a 18 month old? I have a backpack that she can sit in and is generally pretty happy. I want to take her hiking this weekend but worry this might be a bit too much. I’ve active and hike pretty often. Hi Ashby! Doable, yes, but the trail to the falls especially is very rocky and the footing can be tricky. I’d highly recommend using trekking poles if you give it a go — they’ll help you stay on your feet and avoid any mishaps. Good luck! Sam’s Point is open. We went there today (4/3/2015). The Ice Caves Trail is closed. Still lots of ice/slush on the trails. We didn’t go further than Sam’s Point because it started pouring, so, can’t comment on the rest of the park. Thanks for this very helpful comment, Kathee! I just updated the trail guide accordingly. Hope you can see more of the sights next time! Was so excited, as this is one of my favorite places & made the drive up today but it was closed. After calling the line the machine stated closed till further notice so I found on the website they’re doing cliff renovations. Make sure you call before you head up if its any time soon. Luckily there are many other near by places. The overlook is awesome, but to me, the waterfall is the real money spot on this hike, followed by the ice caves, overlook and lake, so it’d still be worth a trip. But if you can’t get to any of that, I’d like to get the trail guide updated with a big fat warning not to waste your time. Thanks for any more light you can shed on this one, and thank you for taking the time to let us know about the closure! Thanks for helping to keep other people from driving all the way out there just to be disappointed. Happy adventuring! It’s always worth it at Sam’s Point, but the falls are likely to be a trickle this time of year. The leaves would more than make up for it, though — enjoy if you pay a visit! I love this hike. I’ve done it a number of times along with the Lemon Squeeze at Mohonk. Can you recommend any similar hikes in the area. If you see one with a short description that looks like a winner, you can click the thumbnail image of the hike to visit the full trail guide. You’ve already picked two of my favorites – hope that helps you find some more! I love it here I go at least once a month. I bring my 3 Newfoundlands w my brother. We love the hunks minmewaska included but Sam’s point is my favorite. For an intense hike try the ice caves verkeerdekill falls continue to the high rock point I can’t reember the name ATM and come back around to the trail around the lake it should be 9 to 10 miles and take from 3-5 hours depending on your speed. The view is well worth the difficult climb. Just got back today (April 4) and we had a great time. Thanks for such a great trail description! Most of the snow had melted, not enough to open up the ice caves, but plenty for a roaring waterfall. The walk around the long trail was wonderful- it’ll only get more scenic as the trees grow foliage and the critters settle in. Thanks again for your guide. If you decide to go, I hope it’s a great experience! ne? Can you clarify that. Nonetheless spectacular views, Ice caves were awesome, but if it hasn’t rained save your back and your ankles for the trip to the falls. Just finished hiking this over the weekend, have to say it was pretty amazing. We started at 11:30 am taking the left at the parking lot onto the Loop Road. Went to the viewing point of the lake off Loop Road, Indian Rock, up to the High Point, down to Verkeerder Falls, the Ice Caves, and the back to the parking lot. Finished up at 7:10 p.m.
Didn’t really read the map much until afterwards. Inititially I thought we were doing a 5 mile hike, but it seems in accordance to the map it was 10.5 ish. It got brutal towards the end. Went with a group of four + 2 dogs and I think we were all pretty beat up by the end, but overall great time and would highly recommend taking a visit to this location. What a wonderful writeup. After looking at a number of places, this definitely stands out based on distance, difficulty, and reward. I’m planning on going this weekend… can anyone comment on how busy it will be and what time parking will fill up by? I’m coming from NYC so it’ll be around a 2-hour drive for me. What time should I get there to be safe? We hiked there last Sunday. We arrived around 9:15 am and the parking lot had only about three cars in it. When we got back around 2:30 pm, the parking lot was completely full with no spaces at all. It was a beautiful hike – enjoy! That’s good to know Jean, thanks so much! So excited for tomorrow! Thank you, Jean! And have a great trip out there tomorrow, Juan — looks like a perfect day for it! We hiked both Verkeerderkill Falls and the Ice Caves today, after reading about them on your site, and it was awesome. Just wanted to say thanks for all of the detailed information and tips – great site! When the water’s high, sometimes you don’t have a choice but to dip your feet when you’re trying to get to the falls! That shouldn’t be the case this time of year, though. Lake Maratanza (step 18 above) or the stream just above the falls (step 11) should do the trick. And the ice caves are cool pretty much all the time. Hope you have a great trip! You picked a great hike to check out. Wow, your summary gives it great justice! Thanks! Loved your description. I was there years ago with Wild Earth Adventure club, but now want to go with a friend. You made me so badly to come back, beautiful pictures and very thorough directions. I am going to use it as a guide tomorrow. Thanks for the very kind words, and that’s awesome that you’re using this guide! I hope you have a great day out there. This really is one of earth’s last great places. Sam’s point is awesome and the falls are gorgeous! I went down to the ice caves and they were really cool, both literally and figuratively. Didn’t make to the lake (my knees rebelled after the falls trail, which I would say is not just very rocky in parts, but just plain very rocky throughout. I felt like I was getting a break if there five feet of the trail with no rocks), maybe next time. Totally worth the ten bucks. Thanks for this site. I use it all the time to find places to hike. I almost always say that the last place I hiked is my new favorite place, but Sam’s point is going to be hard to top. That’s great news that you’re getting some use out of this site! Really glad to hear it. I also don’t know why I ever used the phrase “rocky in parts” to describe the falls trail — I took out the “in parts” part. There. That’s better. Thank you! And man, I need to get back out here again. Sam’s Point really is tough to top. We hiked here last Sunday and you really don’t have to wait long for some gorgeous views. Headed to the ice caves first (one of the coolest places on this hike) then took the trail to the falls. A lot of that trail was flooded with ankle deep water due to the rainfall last week, but it made the falls that much better when we got there with our wet feet! Wonderful place! Thanks again for the info. Glad you had a good day out there! And thanks for the heads-up about the water on the trail, too. Hope your wet feet have forgiven me for not calling that out in the trail guide — it’s now updated with a warning about the trail’s less-than-stellar drainage.